The attack, which allegedly took place on April 25, was conducted by Jobhat al-Nusra. Upon analyzing the video, it is apparent that the bodies of the soldiers are all intact and very few signs of blood can be seen on them. Gas masks can also be seen next to the soldiers as if they had been trying to put them on but were unfortunately too late in doing so. As Mimi Al-Laham (aka Syrian Girl) has pointed out, every visible gas mask is seen lying next to a soldiers’ hands. What can be seen, however, is the apparent blistering of exposed skin, indicating the possibility of a blistering agent having been used. Blistering agents are known to cause the burning and blistering of the skin as well as the esophagus, a most unpleasant way to die. In her own video analysis available for viewing on YouTube and entitled “Evidence: Rebel Chemical Attack on Syrian Soldiers,” Laham posts a picture of the aftereffects of blistering agents on soldiers in other conflicts (like mustard gas in WWI) compared to the injuries seen on the Syrian soldiers found dead in Deraa. Laham also compares the injuries sustained by the dead civilians in the Ghouta chemical attacks with those of the Syrian soldiers, with the two groups having many similarities. 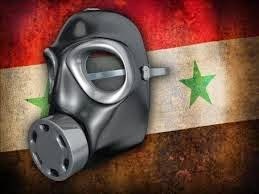 In the end, while the video that has recently surfaced from Deraa seems to show evidence of chemical weapons use, the fact is that we simply do not know the true cause of the soldiers’ deaths. Since the culprit would have logically been the death squads, it is thus unlikely that the Western world and international humanitarian organizations that howl over the alleged crimes of Assad will do the same in this instance. As Laham asks in her own video, “Where are the UN inspectors now? Where is the OPCW now? And where are the ‘red lines’ now?